This week’s Lucifer revolved around my favorite divine object — Azrael’s blade (a.k.a., Angel of Death’s blade)! I have a small obsession with the Angel of Death and this episode hit all the right fangirl notes. At the beginning of the episode, Lucifer is in session with Linda who is not paying any attention to Lucifer’s latest woes. In fact, she is still trying to get over the whole “he’s the devil” thing. Linda keeps shooting Lucifer question after question about hell and ignoring Lucifer’s problems. The day is saved when Chloe calls Lucifer to the crime scene of the week. The episode began with a woman being stabbed. Lucifer arrives at the crime scene and realizes his sister’s blade is the culprit. In human hands, the knife demands to fulfill its purpose — killing — and it magnifies human emotions tenfold. Not believing that the blade is out in the public, Lucifer heads to Uriel’s grave site. Lucifer realizes someone dug up his brother’s grave and stole the blade. Lucifer then asks Ella for help tracking down who took the blade. The two begin to work the case of the missing blade together, causing Chloe to get mad jealous of her partner’s wandering attention. The entire episode shows Chloe’s growing jealousy of Ella and Lucifer’s time together — the question is: is it too soon for those two to get it on? I think so. Give me slow burn, or give me death! 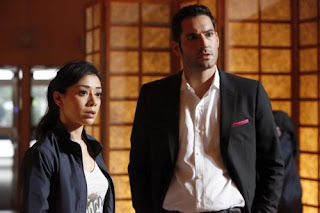 Ella eventually comes through in her investigation and Lucifer discovers that his mother is the culprit. She sent several people to go to Uriel’s grave to retrieve the blade. She was hoping to get God’s attention because she allegedly wanted to mourn with her husband. She assumed a bunch of dead people would do the trick. But it failed. Lucifer confronts his mother telling her, “Hell wasn’t home and Heaven was hell,” and that Earth was the only place he’s ever felt respected. However, did the blade cause Lucifer to say those things? Also, why was the blade glowing and flame-y? Did Lucifer cause that? So, how did Lucifer get the blade back exactly? Well, Lucifer and Chloe’s investigation ended in an overlap. At the final crime scene, Dan gets a hold of the blade and almost kills Lucifer. However, Dan can resist it long enough for Lucifer to get the upper hand and take it back. Yay Lucifer (and Dan). Chloe, at this point, is SUPER suspicious of the two of them, but I am totally digging this friendship. The episode ends with Ella taking Lucifer to church. She feels as though Lucifer is looking for something, and Ella admits her life got back on track when she started talking to God. Lucifer isn’t too pleased, but he does go with her, keeping true to his word. It is 100% too soon for Lucifer and Decker to get it on. I love the slow dynamic they are building and I think it is far more believable she is worried about losing her partner than a potential lover, but that’s just me. Maze is everything I aspire to be and more. I still lowkey hate Amenadiel. This whole “mama’s boy” act and utter betrayal of his father seems out of character to me. I am not a big fan of his current storyline. Give me my powerful angel back! I also need to see Lucifer with his wings. How do those wings look on the bloody and tortured body we saw in Linda’s office? I am so on board with Linda knowing and being so awesome about the supernatural stuff. I just home dear old mom doesn’t target her.